Hi, just a quick update on my social networking scene. In general I am active on Facebook and Instagram, somewhat active on Google+, barely active on Twitter and I have a pulse on Flickr. I used to be a lot more active on G+ but I've found the interaction has diminished there somewhat. Facebook is great for railfan groups. I'm really enjoying the train photos on Instagram. 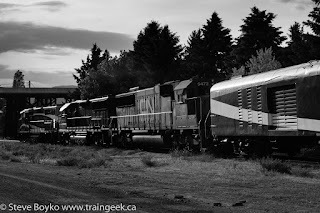 My post on Instagram for railfans is one of the most popular posts ever on my blog, amazingly enough! I think Facebook has really taken over from the railfan mailing lists of yore. The RailsNB mailing list was deleted a few months ago because the Facebook group has become so popular. I have a tumblr account as well but I'm not on there very much at all. Here's a little secret. I'm not on Flickr or tumblr much but I post there all the time. How? I use the IFTTT service. This is a great service that basically allows you to create actions based on other actions you take. I have recipes there that repost my Instagram photos onto Flickr and tumblr, so they get updated with new photos with no additional effort on my part. Magic! I suppose I also have accounts on tsū and ello but I hardly ever look at them, to be honest. Those social networks haven't really taken off. So... where are you social? Comment below! PS - notice the photo in this post, a sneak peek of upcoming content! PPS - want to know how to get Instagram followers, ethically? Not sure where you get the time and energy to do all your social networking and blog updates and such. ?? Wow, just wow! But....we are all the better for your blogs and railroad miscellany. Thanks for all your greater efforts. Thanks, Glen! I find little snippets of time here and there. Thanks for reading and commenting.